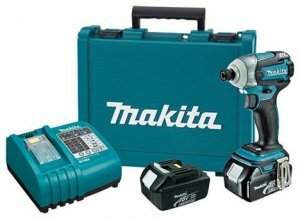 It doesn't look like Makita is on the same product release cycle as the other manufacturers. They have already released a couple of impact drivers this year, but I guess there is always room for one more, especially when it will replace their top of the line model. Makita's new LXDT06 3-speed impact looks like the replacement for the year old LXDT01. The LXDT06 features the same selectable 3-speed functionality as the 01, but it also has a new trick up its sleeve. If I understand this correctly from reading the data sheet, a new Quick-Shift feature has been added specifically for driving self-drilling screws. Quick-Shift delivers a faster initial RPM (2,800) which is better suited for drilling, then when the tool is ready to impact it automatically slows down (2,300) as to not strip out the screw. It is also uses Makita's latest brushless technology which is electronically controlled to be more efficient and provides longer run times. In addition, the new LXDT06 is 3/8" shorter than the 01, has a higher torque rating at 1,500 in. lbs. and is engineered to be dust and water resistant. There is no word yet on pricing or availability.